Flockhart was established in 1882 as Maher, Robinson & Flockhart, a foundry located at 86-88 Polk St. Newark, New Jersey. In 1897, Robinson had withdrawn as a partner, and the business, now called Maher & Flockhart, was described by Dr. M. H. C. Vail in a publication entitled Essex County, N. J., Illustrated as follows: "The lower section of the city east of the Pennsylvania Rail road is steadily advancing as a manufacturing centre. Here are situated many large industrial plants, located among them being the large iron foundry of Messrs. Maher & Flockhart, corner of Polk and Clover Streets. "The firm had a very humble beginning. In May, 1882, they rented a small building on Polk Street, and with the assistance of one employee, commenced the manufacture of grey iron castings. Being practical men and thoroughly conversant with the foundry business, they soon established a reputation for making heavy and light machinery castings of a superior quality. The result was that their business increased to such an extent that each year saw an addition to their plant, until every available foot of ground was occupied. "In 1889 they purchased a large plot of land bounded by Polk and Clover Streets and the New Jersey Central Railroad, upon which they erected a brick building 80 x 200, with additional buildings for boiler and engine rooms and pattern shop, which forms the illustrations herewith given. In 1891 they again found it necessary to increase their capacity, and erected a building 65 x 85 for the manufacture of light castings exclusively. They employ over 100 men, the majority of whom are skilled mechanics. Being progressive business men and thorough mechanics, their foundry is equipped with the latest improved cupolas, power cranes, and every appliance to facilitate the manufacture and handling of castings. A siding connects the works with the main line of the Central Railroad." The illustration referred to by Dr. Vail shows men assembled in front of a large one-story structure with two wide doors (click for image). A section of this structure appears to have survived (as of Jan. 2010) at the corner of Polk and Clover streets, but unfortunately does not bear a Flockhart sign. Newark, the City of Industry: Facts and Figures Concerning the Metropolis of New Jersey, published under auspices of Newark Board of Trade, 1912, also shows a picture of the Maher & Flockhart works (with several chimneys belching black smoke). This work is available online as a Google Book. In June, 1915, the trade journal, Iron Age, published a description of a Maher & Flockhart catalog as follows, "Maher & Flockhart, 60 Polk street, Newark, N. J. Catalogue. Shows various designs of special castings such as sewer and manhole frames and covers, gutter bridges, grate bars, screw jacks, fence and mooring posts, japanning and smelting kettles and contractors' tools. The catalogue is made up almost entirely of halftone engravings, the only text being the captions of the cuts. Mention is also made of a line of light and heavy machinery castings of all descriptions that can be supplied up to a maximum weight of 25 tons." In August, 1918, the New York Times reported the incorporation of the Flockhart Foundry Co., described as, "iron founders, Newark, $1,200,000; James Flockhart, Robert E. Moore, John Campbell." Robert Elwood Moore (1893-1961) was James Flockhart's son-in-law. He registered for the World War I draft in 1917 when employed as an assistant supervisor at Maher & Flockhart, 60 Polk St. He married Flockhart's daughter, Linda, some time after this date. In 1920 he and Linda (now Linda Moore) lived with her father at the Flockhart family home on Mt. Prospect Ave., Newark. The Moore couple had a daughter, Margaret Moore, whose age is hard to read (in the 1920 US Census); it may be 20 months. Robert E. Moore was president of the Flockhart Foundry approx. 1940 to 1961. James Flockhart's younger daughter, Marguerite Craig Flockhart (1894-1951), succeeded him as head of the Flockhart Foundry when he died. This obituary notice for Edward Maher (1850-1907) appeared in the journal, Foundry, August 1907. John Campbell (1873-1936) is described in Prominent Families of New Jersey, vol. 1, by William S. Myers, 1945?, as the proprietor and founder of the Campbell Foundry Co.: "Established in 1921 in Harrison [New Jersey], the Campbell Foundry Company was created for the manufacture of gray iron castings. The founder was John Campbell, who was president of the company until his death in August, 1936... John Campbell was born May 15, 1873, in Glasgow, Scotland, and received his early formal education there. He came to the United States in 1880, settling in Newark and entering the iron foundry business. For approximately thirty years he was with Maher & Flockhart, in Newark, of which he later became treasurer. He left them in 1921 to organize the Campbell Foundry Company..." The Caledonian, vol. 8, April, 1908, contains a portrait of John Campbell as well as a short biography which specifies his place of birth as Springburn, near Glasgow, Scotland. The Flockhart entry in Sweet�s Architectural Catalogues, 1933, included: Flockhart Foundry Co. Engineers and Manufacturers of Standard Construction Castings. Main Office, 87 Polk Street, Newark, N. J. Established 1882. Products: A complete line of Construction Castings adapted for construction of highways, water works, storm and sanitary sewers, sewage disposal works, docks, gas and electric plants, etc. Castings are made of gray cast iron, guaranteed against breakage. Among other Flockhart products illustrated in Sweet's were these curb drains and gratings. This advertisement for the Flockhart Foundry appeared in a Newark city directory in 1938. In Jan. 2010 an item offered for sale on e-bay consisted of a 1961 Flockhart sales catalog, specifying manhole frames, inlet frames, catch basin frames, troughs, trench frames, airport castings, armored concrete, and wheel guards among its products. One of the drains at Wooster and Grand Sts. is marked Maher & Flockhart. 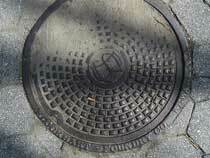 Two other Maher & Flockhart manhole covers are found in John Jay Park at the east end of 77th St. 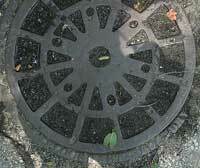 There is also a very worn drain reading "Maher &" at the corner of Amsterdam Ave. & 77th St. This would be yet another Maher & Flockhart in New York City. The corner of Morton St. and Bedford is another location where Flockhart Foundry and Maher & Flockhart drains are found in close proximity. 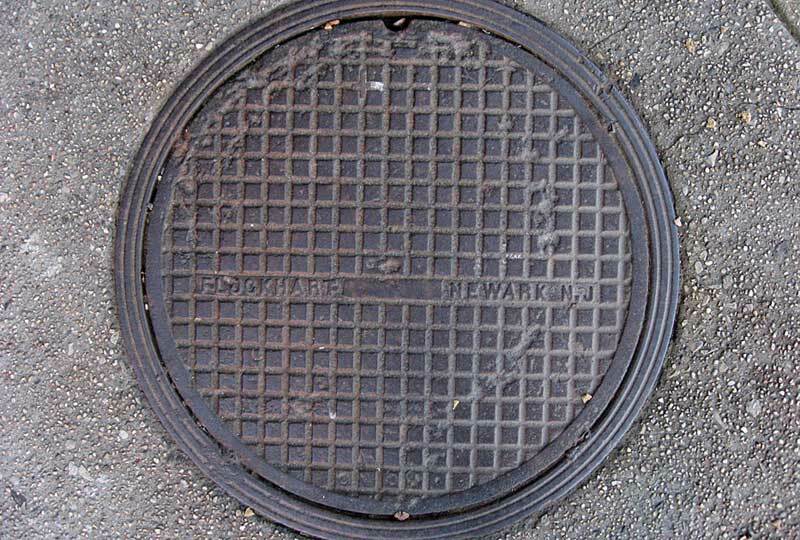 There are probably many Flockhart manhole covers in Newark. I found this one dated 1937 at the corner of Adams and Downing Sts., very near Polk St. where the foundry was located.